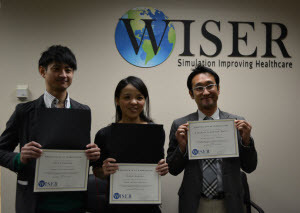 WISER is pleased to have welcomed individuals from Tokyo Healthcare University. Visiting WISER were Dr. Kazuhiko Yamashita, Kaori Kusuda and Yuta Funayama. During their time here, they were exposed to creating preprogrammed scenarios for simulations, different methodologies in debriefing, and the role of a simulation specialist at a simulation center. They were also educated in the use of information technology and how it can be utilized to conduct research and create courses at WISER. It was a pleasure having them here for their preceptorship.